It was an evening to honor those who have, over the longrun, supported the police officers of the City of Los Angeles. 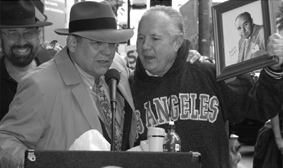 In this case, three accomplished professionals took to the stage to accept an honor established in the name of another great LAPD supporter, Jack Webb. The ceremony was well-attended, well-executed and wellreceived and replete with top cops, the Webb family and world-famous entertainment and announcing. The evening was a perfect backdrop to bestow awards on some folks clearly known for backing the badge. Bestselling author James Ellroy expertly administered the ceremonies as only a man of his great imagination and eloquence could. James brought renowned singer Buddy Greco to the program. The crowd was clearly entertained by Buddy’s musical talents. Chaplain Steve Hillmann provided the invocation and Sky Green sang the national anthem while the Department Color Guard posted the nation’s colors. One of the honorees formerly wore the LAPD badge, but now wears another distinct badge beneath his business suit. District Attorney Steve Cooley, a tried and true police professional, spent six years serving the Department as a Reserve Police Officer. But his full-time job was putting bad guys away in the courtroom. Through his accomplishments in this setting, Steve was recently elected to another term as this county’s District Attorney. His pursuits of hoodlums and hooligans will continue from this position, and we are all better for it. Given his distinct service to the Department, and law enforcement in general, the Los Angeles Police Historical Society was proud to honor the District Attorney with a Jack Webb Award. Our District Attorney, however, is not the only lawyer noted for his crime-fighting past. Jay Grodin served two other great law enforcement agencies, the Los Angeles Sheriffs Department and the FBI. His federal tour of duty took him through an early domestic terrorism investigation. As the lead agent of the Weatherman investigation, Jay was responsible for tracking the group’s activities in the Bay area. Jay left the FBI to pursue his law practice, and has now retired from a successful career specializing in acquisitions and mergers. Besides his successes in the various legal arenas, Jay devoted himself to serving his native city. He is a past director of the YMCA of Metropolitan LA and the Sheriffs Youth Foundation. In service to the LAPD, Jay also served on the board of the Police Band Foundation. His Jack Webb Award was presented by retired Chief Daryl Gates, to whom Jay served as a trusted legal advisor. 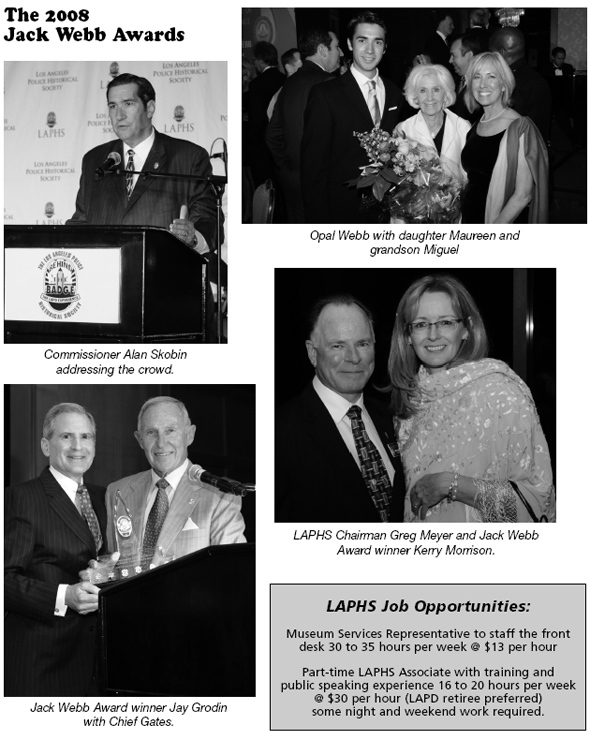 LAPM is honored to have both Chief Gates and Jay Grodin as active supporters. 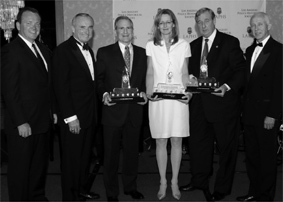 First Assistant Chief Jim McDonnell, Chief William Bratton with 2008 Jack Webb Award Winners Jay Grodin, Kerry Morrison, and District Attorney Steve Cooley and LAPM Vice-Chairman Danny Staggs. entertainment capital of the world also extends to the Hollywood police family where Kerry serves on the CPAB and chairs the PALS program. Kerry, like the other honorees, is both educated and talented. The Hollywood community and the Department are fortunate to have Kerry as a partner. So too, is the Historical Society. We are honored to present Kerry Morrison with a 2008 Jack Webb Award. Clearly there is commonality with this year’s Jack Webb honorees. Each a true professional devoted to service, and each busily embraces the community in which they live and work. All are deserving of the Jack Webb Award. Congratulations to all. 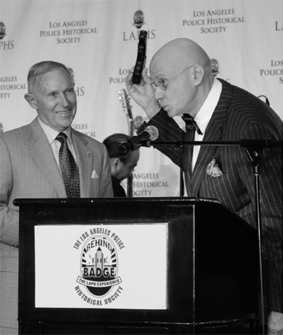 Best-selling author and Master of Ceremonies James Ellroy shares a light-hearted moment with retired Chief Daryl Gates. 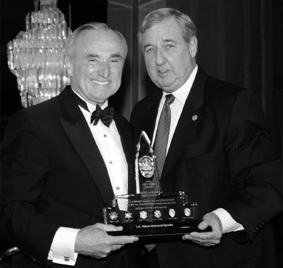 Chief William Bratton with Jack Webb Award winner Steve Cooley. Much of the Historical Society’s collection is used to highlight one of the world’s most recognized and respected law enforcement agencies, the LAPD. The photo archive dates to the late 1800s and houses a unique variety of images of cops on horseback, cops in cars, cops in choppers, cops with cops, and cops in the community. Much progress has been made in organizing and preserving a good portion of our holdings. Some of the material, however, needs professional help. To assist with this, we have prepared and applied for a federal grant that will assist us with preserving nearly onehundred tightly wrapped photos. If we are successful in winning this grant, look for history to start unrolling in the summer of ’09. While awaiting the results of this grant process, we have been busy with some other projects. On October 4, we accepted the invitation of Council member Tom LaBonge for his annual 10-4 day parade. We joined a number of other owners of restored, or replica police cars and made a code-3 pilgrimage to Broderick Crawford’s star on the Hollywood walk of fame. A brief ceremony was conducted at the star, then everyone retired to the LAFD museum for a slice of cake that featured likenesses of Crawford and his vintage CHP cruiser. Councilman Labonge expressed his thanks to all of the public safety folks in and around the City. The Councilman has long been one of LAPM’ most respected partners, and we thank him for looking out for the public safety family. Another member of the extended LAPD family, the Los Angeles Police Federal Credit Union, recently paid us a visit. We might not have a star on the walk of fame, but we have our very own star of stage and screen, Old Number 11. The credit union stopped in for a training session on October 13th. Besides conducting some of their own business, the entire staff of the credit union toured the museum and experienced first-hand the recent progress we have logged. This was another great collaboration between LAPM and one of its long-time supporters. Later in the month, we will be planning a visit to see some of our partners in the archives community. Archives Live! the Los Angeles Archives Bazaar, will occur on October 25th at the University of Southern California. This event outgrew its former digs at the Huntington Library. For those interested in historical research, this is a great place to come and learn about the resources available in the area. World class museums like the Autry and the Getty are represented, along with some of the lesser known operations that also have photo and research archives. Check the LA as Subject website for more details. In the not too distant future, we will be unveiling the Boeckmann Gallery of Los Angeles Police Commissions. Presently, the formal opening is scheduled for December 2. This invitation-only event will allow us to publicly unveil the history of the Police Commission. The gallery is a multi-media exhibit of the many and varied roles played by the Commission since its 1870 inception. So many of the major events of the past have involved the Commission, and a number of the most important occurrences are displayed in a timeline. Also on display are the details of the Commission’s involvement in the Medal of Valor, the Department Manual, and the selection of firearms for police officers. Some of our most unique artifacts are displayed in this gallery and we look forward to opening the exhibit to the general public. 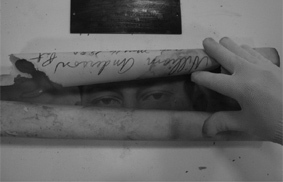 A rolled photo of a slain officer. Grant funds are being sought to professionally care for these vintage pictures. Through the generosity of Leslie Maris at Police magazine, we acquired advertising space for the LAPM challenge coin. There has been a great response for the coin from customers in states near and far. The coin contrasts the first LAPD badge, and eight- pointed star with the Department’s current badge. 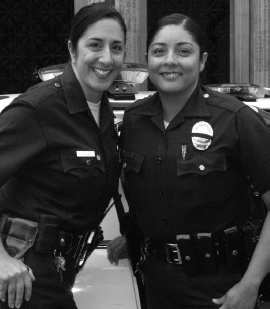 Our coin is truly a representation of the “then and now” of the LAPD. The coins are currently out of stock, so we appreciate the patience of those who are standing by to acquire them. A new shipment should arrive soon. We are not waiting to tip our hat to Leslie Maris and her staff, we extend our thanks to them in the here and now. So much of what has been covered in this column speaks to the many partnerships the Historical Society enjoys and treasures. The same is true for each of our loyal members. Thanks to each of you for helping us develop and grow the Historical Society and the museum. Please remember to visit us in person or on the web at www.LAPM.com. 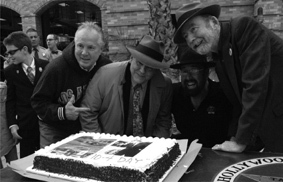 The 10-4 day cake with (left to right) Councilman Tom Labonge, Gary Goltz, Shotgun Tom Kelly of KRTH 101 and Broderick’s son, Kelly Crawford. Councilman Tom Labonge and 10-4 day organizer Gary Goltz.